Blogger and writers put their heart while writing the blog post but think when they find that their effort has been copied. How will they feel? Recently, I found one guy on Facebook closing his blog because other was stealing their content and despite many notifications that guy didn’t stop copying his content. He even complained to Google but due to some mistake, Google removed his content from the search engine. I don’t want to happen this to you. 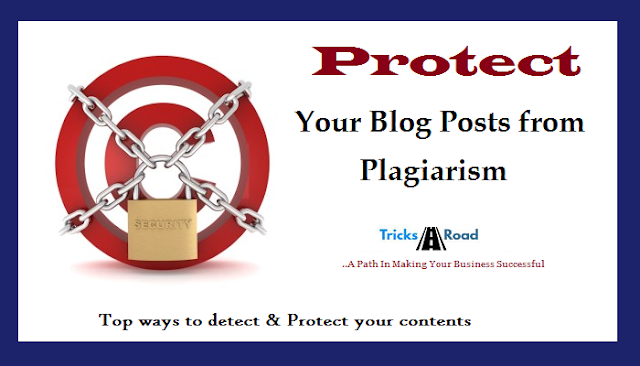 In this article, I’m going to share few methods to protect blog posts from plagiarism. Below I am going to share few tips using which you can protect your contents from being copied. Also, I'll share some tips using which you can take action in case if your content has already been copied. This is a very uncommon method but belief me, this method will help you a lot. Let me tell you in detail. Once you’ll give your article personal touch it will look different. At TricksRoad, I write all the content personally except few high-quality guest posts. So you’ll frequently find that I include more about my personal experience here like how I achieved it or how that method helped me etc. So by using these methods I give a personal touch to my articles and one thing is surely more than one people can’t have an exactly similar story. So according to me giving a personal touch to your articles will help you to protect your blog posts from Plagiarism. Don’t worry it’s completely FREE. Whenever you write a good content, give some more time protecting that content. I’m sure writing a good blog post can take a minimum of 2-4 hours (I usually take around 3 hours for a blog post) so why don’t you spend 5-10 more minutes copyrighting it. The best way to register your site for copyright is by registering at myfreecopyright.com. Also, register with DMCA. These will help. • Make this a habit of bookmarking the image or put your logo or something like that to your images so that others can’t use it directly. • Use copy scape and DMCA. Register your blog to these sites and get help in bad times. It is good to take precautions and keep yourself secured from any unusual stuff but still there are chances that your content may get copied. So what to do now? There are many sites which can help you in such scenarios. These sites can tell you if someone has stolen your content and then you can take any manual action against thieves. Below are few such sites. The simple and awesome ways to do this but is bit lengthy. What you have to do is, copy some part of your article and paste in Google and see if any site showing in the search result are using your content or not. But this is bit lengthy process. This is a free tool to check whether your blog posts have been copied or not. Just paste your link and copyscpae will display the list of sites that has the same content. If the result has any site, you can take further action. This is only available on WordPress blogs. Here you can enable ping and it will notify you whenever someone will link to your blog. You can also keep checking your contents using plagiarism checker sites like Small SEO Tools, Plagiarism Checker etc. But all plagiarism checker don't provide all the required features. And so, before finalizing any plagiarism checker tool, make sure that plagiarism checker tool has all these listed plagiarism checker features. This is also related to Step 4 itself but I am listing as a new method due to it’s added advantage. This website enables you to protect from the thieves by creating a link back to your site. So if anybody is copying your content, it will create a link back to your site and hence your site’s SEO will get improved. This is the best that you can get from the thieves. This increases your blog's SERP and hence increasing your traffic. After going through the above steps, I’m sure you will find the one who is stealing your content. So now it’s time to take action against them. Below I am giving your few tips using which you can get their copied content removed from the web. This should be your first step towards taking any action. You should be soft first. Reach out to the people who have copied your content and ask to remove your content. If it is image or infographic or any such shareable stuff you can ask for the backlinks. You can contact them by emailing or using the contact form on their sites. In most of the cases once you will complain, the people who have copied your content will remove from their site. If not, move to the further steps. This should be your second step. If somebody has copied your content and he/she is not removing using step 1 you can go ahead and file a DMCA complaint. You can check this link of DMCA to know how you can file a complaint. You can also file a complaint to Google against those and ask Google to remove the copied content from the web. 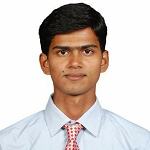 Google provides different complaint form for different blogging and website platform. Be sure while filling up these forms to provide the genuine information and explain each and everything in details. This will help for sure. These were some tips about How to protect your blog posts from Plagiarism and what to do when someone have copied your content. I am sure by using these techniques; you would be able to protect your content in a better way. I would love to know about the techniques that you are using to protect your content. Do let me know in comments. Also, subscribe us for free resources and freebies.